In today’s technology-driven world, robust IT infrastructure is fundamental for an institution’s success. As it is unfeasible to have all the latest hardware and the right software solutions on-campus; more and more institutions are turning to outsourcing IT services to provide their end-users a positive support experience. At BlackBeltHelp, we understand the responsibility this trend puts on us. That’s why we follow the best industry practices, employ highly-qualified support agents, and deploy the latest technology tools. Years’ of experience providing IT services to higher-ed institutions has made our team adept in delivering on the SLAs and creating a strong ecosystem of IT support for your end-users. Moreover, by partnering with us, you experience increased efficiency at lower costs. Our general IT support extends to Computers, Laptops, Smart Phones and Tablets, Email and Communication, Network Connectivity, Printers and Scanners, Virus Removal, Operating Systems etc. Ensure data security, privacy and compliance with the latest regulations and privacy rules (GLBA and GDPR) and close the loop on cyberthreats, data thefts, and government penalties with BlackBeltHelp IT security services. Ensure that your organization doesn’t suffer in case of any system failure or post-disaster scenario. Gain the flexibility to choose the data you want to protect, for as long as you want to protect it with our cloud services and backup. We provide a wide range of IT Managed and Cloud Services which help clients apply technology in the most effective, target-oriented way and provide assistance to navigate the complexity of legacy systems while enabling innovation. Our key managed IT services include ERP Services, Microsoft Azure Migration and Managed Services, Amazon AWS Migration and Managed Services. Make the best out of your Microsoft® investment with our stunning range of professional services that challenge and unlock Microsoft’s potential to deliver the best they can. When you outsource BlackBeltHelp IT services, you have the chance to focus more on your core competencies while our IT experts help you gain an edge over your competitors with their unparalleled expertise and innovative technologies. With BlackBeltHelp’s experienced IT staff at your service, you don’t have to worry about planning for increased seasonal support needs. We take care of all such temporary surges and provide consistent, high-quality support to your end-users even during the peak seasons. Our experienced IT services team possesses the extensive domain knowledge and technical expertise. Our ongoing training and development ensure that they are at all times equipped to take on new challenges and serve your end-users better. We use latest tools, technologies and platforms to measure outcomes. Our team shares customized reports with user institutions regularly to enable them to identify emerging themes/trends in IT support calls and facilitate transparency and accountability. We deliver omni-channel support. Whether your students want to chat, call or email; someone is always listening at our end and springs into action as soon as they receive a request. Our analytics-powered platform integrates with institutions’ enterprise systems and transfers key information to a single Agent Desktop, saving time, providing a seamless experience, and making our best-in-class support possible. 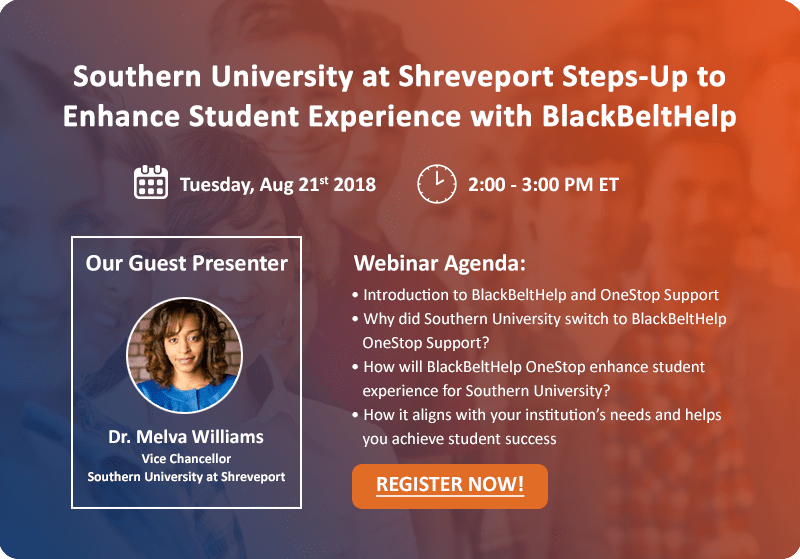 If you want to make sure that somebody is always there to support your student, faculty member and administrator even during non-business hours and weekends, this is where BlackBeltHelp after hours support service can come to your salvage as we can turn every hour to a business hour. We believe support should be available whenever it’s needed hence all of our programs whether it's inbound/ outbound help desk services are supported 24-hours each day, 7-days per week, for 52-weeks each year.